Over the last couple of months, as I met with alumni, community members, and prospective parents, I was asked repeatedly to define who we are as a school. In response, I found myself describing our amazing children, our exceptional and committed faculty and staff, our dynamic and challenging curriculum, and our beloved traditions. I was reminded over and over about how exceptional we are as a school and as a community. That being said, I still felt that I was not adequately expressing the essence of St. Thomas’s Day School. And then something special happened. One Monday morning I was asked to be the Chaplain. Feeling unprepared and rushed, I quickly grabbed a book off my desk to share with the children. 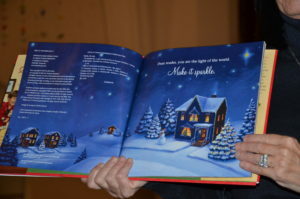 It was The Sparkle Box, by Jill Hardie, a story about a family that celebrates kindness and good deeds by writing them down, storing them in a special box, and sharing them with each other on Christmas morning. 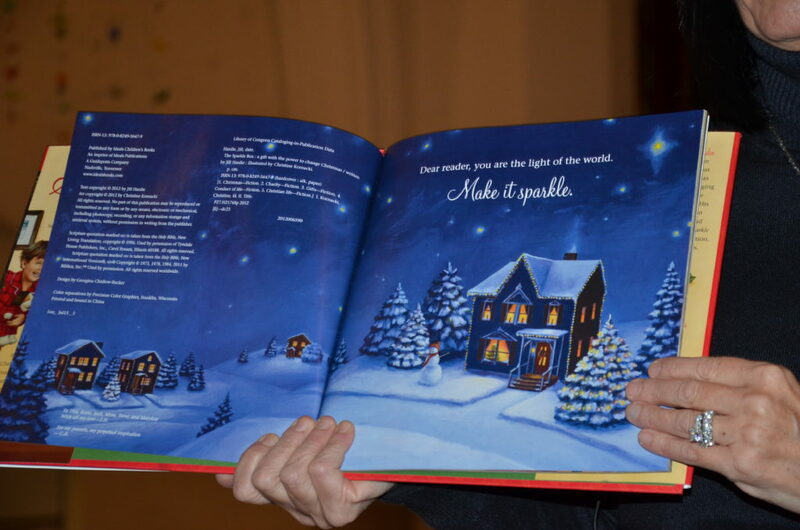 It was exactly the kind of book I needed for Chapel, and I was excited to share it with the children. While reading the story, I glanced around and noticed the kids were engaged and listening carefully – I had a captive audience. 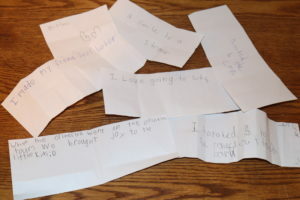 I also noticed the children were making connections between events in the story and our practices here at St. T’s. Afterwards, we discussed the importance of being kind to others and the different ways people give back to their communities. I felt good about our discussion and hoped it had been meaningful for the children. Several hours later while walking into the lobby something shiny and bright caught my eye. To my surprise, it was a Sparkle Box! There was no name, no note, no identifying marks – just a brightly wrapped box sitting on the table. Through the hole in the top of the box, I could see a note inside with large letters drawn in a child’s handwriting. I quickly stacked a pile of note papers and some pencils next to the box and waited. Over the next few days, I watched as the contents of the Sparkle Box multiplied. Each time I looked down at that shiny, hand-crafted box, I knew I was witnessing St. T’s at its very best. Somewhere in our school, a child felt inspired by a story, and created a box to share all of the special things that happen at STTS. That child wasn’t looking for recognition and didn’t need anybody to know who he/she was. That child simply wanted to continue what he/she had learned: to celebrate good deeds and kindness in a community. 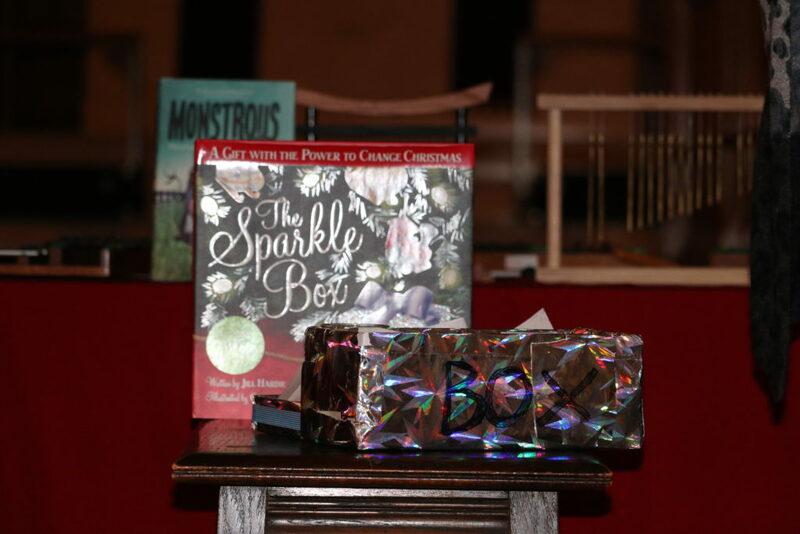 St. T’s is the kind of school where sparkle boxes appear out of nowhere. It is a school where children aspire to do kind things for one another. It is a school where everyone is empowered to make this a better world. Essence captured! Wishing you and all you hold dear a blessed holiday season. ← All Aboard the Lower School Express!